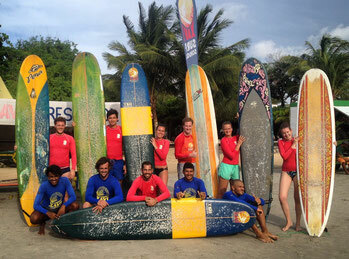 Join a group for a 3x one hour session of coaching with other surfers from around the globe! The Group Lesson is our most budget conscious option designed for the solo traveler looking to have a great time learning to surf or improve their skill set in a group setting. If you are traveling with a small group, the Group Lesson is a perfect way to meet and surf with other likeminded travelers all looking to have fun and progress. Lesson times always depend on the current weather conditions. We usually start our Group Lessons in the morning between 8-10 or in the afternoon between 14-17h, when the sun is not too strong. Traveling alone or your travel mates aren't into surfing? Request a private coach for one-to-one coaching guaranteeing you maximum progress for a fair price.